bark neatly stacked for kindling -- but where's the fire? 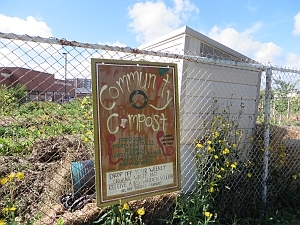 A sign on the fence says "Community Compost. Food scraps.Fruits and vegetables. Egg shells. Coffee grounds and tea bags. Grass clippings and yard waste. 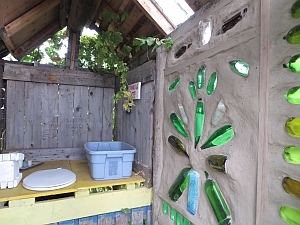 Drop off your weekly organic waste and receive a $5 garden voucher. All day Tuesday - Thursday." The sign looks inviting and we (Yo Utano and Jutta Mason) circle around the fence to find an entrance. The fence is long and it takes us a while -- the garden takes up a lot of space and it looks productive and well-kept but not perfectionist. 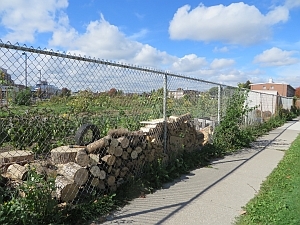 There's a big school fronting on Lawrence Avenue, and when we turn into the long parking lot at the back of the schoolyard, there's the gate. Far into the garden we hear voices, so we go in and look for the people. Then we get a surprise. 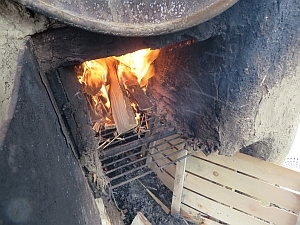 The oven is the reason for the stacked wood at the side of the fence. 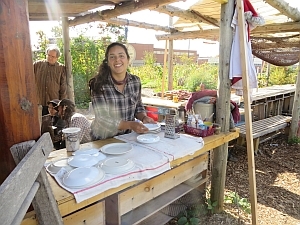 We meet Adam and Isabella, who run the garden, and are cleaning up after a recent event that must have involved the oven -- it's still warm. 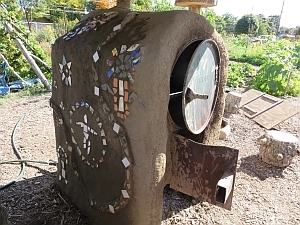 There's a volunteer, Tim, who is proud to show us the oven and tells us how excellent these schoolyard gardens are. The area looks inviting and organized and the dishes are sparkling in the sunshine, thanks in part to a three-compartment sink. 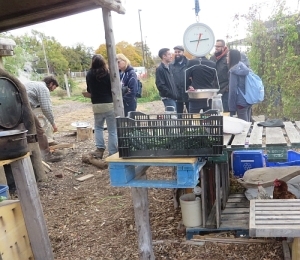 There's a long table with space for lots of harvest sorting and eating and conversation. 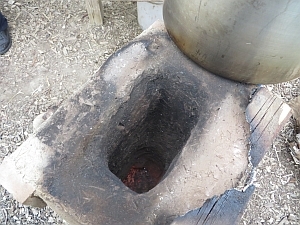 There's a rocket stove, also made of cob. 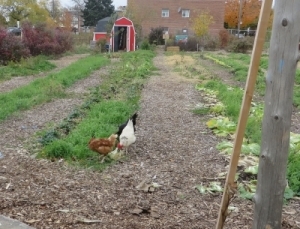 The long garden beds are still full of vegetables, flowers too, and there are fruit trees. 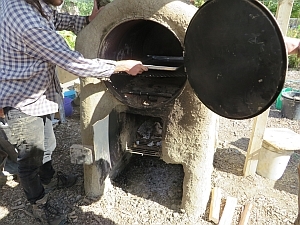 Even though, three years ago, we tried baking in the Lawrence Heights brick bake oven (two blocks away), we were unaware this place even existed. 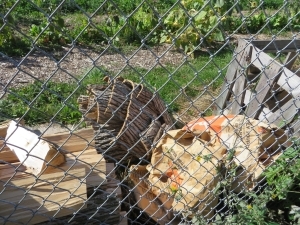 Adam tells us that the barrel is food grade -- once used for apple juice. He's adding a thin layer of mud to some cracks in the outside skin. The cracks look a bit like those on a salt glaze pot. 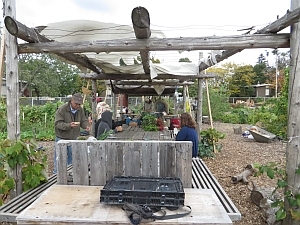 There are some people harvesting, some washing beets, and some sitting at the long tables. 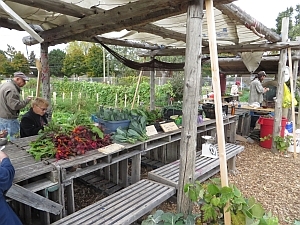 These tables now have bunches of fine-looking produce set out, with prices on little signs. 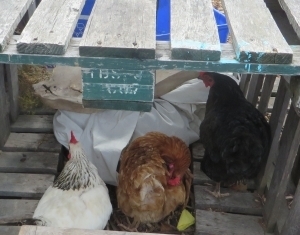 But it looks like most people who come by don't have to pay, since they've brought their compost over to trade. 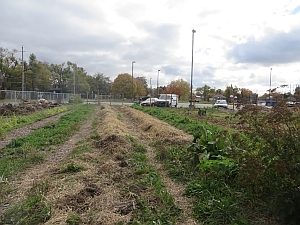 Adam says that in the summer, some of the produce is sold at the Sorauren Monday farmers' market, but in the fall there's too much to do in the gardens, plus there are so many visits from students. 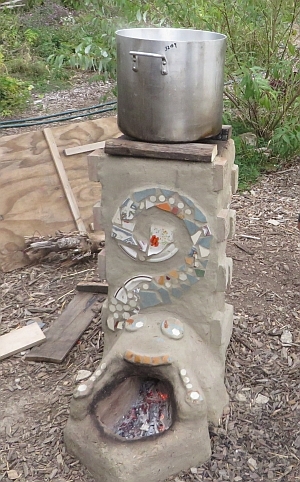 On this fall Tuesday the oven is not going but the rocket stove, also made of cob, has a big pot of soup on it. 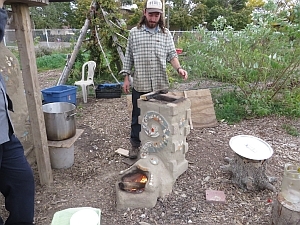 The rocket stove looks different than the temporary one that Alan Carlisle built, but both work on the same principle of highly efficient burning, using little wood but giving lots of heat, little smoke. 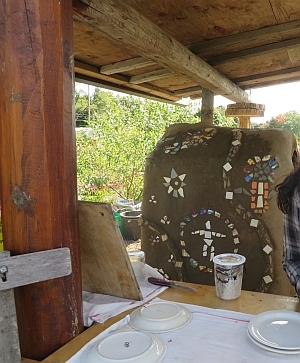 Isabella and Adam say that they had to rebuild the cob oven because they made a mistake building the first one -- they put on cement plaster, and it made a skin that didn't allow the moisture to get out, weakening the clay shell that allows heat retention. 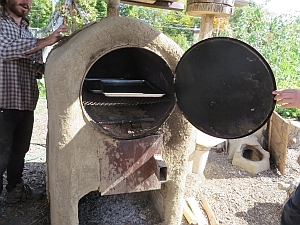 There's a lot more information, stories, pictures about the garden and the building of the oven here at their blog entry from October 2015. By extraordinary luck, I came one more time on what turned out to be the last day of the season. Some teachers and students came over from the High School. 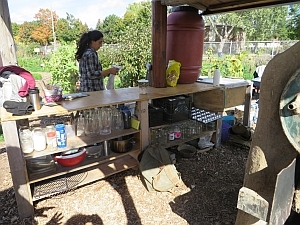 Isabella made nachos in the oven, with the help of two other garden friends, and Adam made soup on the rocket stove. 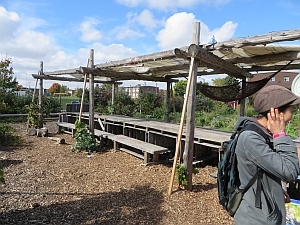 One of the teachers, Rahim Essabhai, told me that his students use the garden a lot, that it's the best kind of classroom, with so much to do and learn. He said that other teachers are also keen. 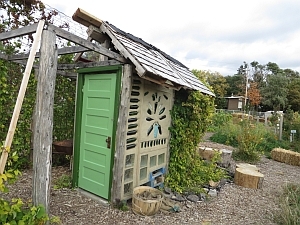 The garden looked tidy and cared for in every part, everything harvested, some beds covered with straw, the segmented compost areas in various stages of decomposition. There are still quite a lot of bags of chopped leaves, brought over by neighbours who first chop the leaves with their mowers. 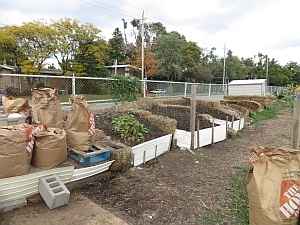 The main compost volunteer said he was a mailman in the area for 30 years, until retirement. 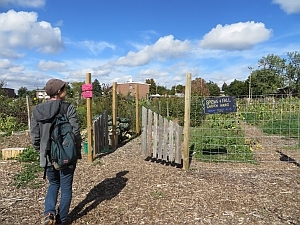 A new teacher came to the fence and asked about the garden -- it turned out she is the food teacher. 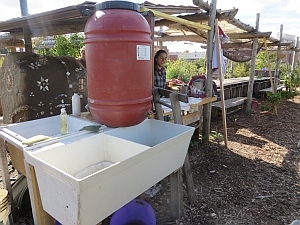 The volunteer encouraged her to come in and everybody showed her the oven and the rocket stove and the rows of kale and collards still standing, and she ate some lunch. 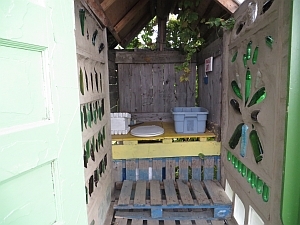 The place is very hospitable.